For some people, the Number 18, Old Smokey Charcoal Grill conjures up long-lost memories of childhood. It was one of the earliest front runners in retail level charcoal grills. It’s success as a charcoal grill, smoker, and portable grill has endeared many. To this day the original design has changed very little, beyond material upgrades. The modern-day Old Smokey #18 is made from something called “Aluminized Steel.” This industrial process involved taking the steel body of the grill and hot dipping it in molten aluminum. The end result is a grill with the heat retention of steel, as well as the rust and corrosion resistance of aluminum. It also gives the Old Smokey an appealing gleam that you don’t find with competitor grills that powder coat or porcelainize their grills in black. This is a no-frills grill that can also be repurposed as a smoker. 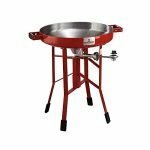 It has an 18-inch diameter, chrome plated grill grate, and two adjustable bottom vents that act as dampers. The volume of the lid is tall enough to let you grill tall dishes like beer can chicken. The Old Smokey Number 18 is incredibly easy to assemble. You basically unbox it and you can put it together in less than half an hour. The aluminized steel keeps it lightweight, ringing in at just under 15-pounds. It also helps with rust resistance and heat retention. The chrome plated grates have a reputation for being pretty sticky, but they are on par when you consider the Old Smokey’s incredibly friendly price tag. One knock on the Old Smokey Number 18 is the lack of a lid thermometer. You can’t blame Old Smokey Products for not installing one in the 1923 original. It’s also not something that you see in competitor grills in this price range. Still, the Number 18 has a reputation for being able to act like a smoker, which means it will really benefit from having a thermometer. This has prompted more than one do-it-yourselfer to drill a small hole in the lid to accommodate a probe thermometer. If you take it upon yourself to do this, you need to find some high heat silicone to seal the hole and prevent air exposure to the center steel layer. Another option is to try to work a probe thermometer into the upper lid damper. This isn’t ideal, as the rising smoke and heat can affect accuracy. The Old Smokey Number 18 has the ability to act as a direct heat charcoal grill. Yet with some care, it can be improvised as a smoker. Indeed, there are people who have spent decades using it just like a smoker. When you want to use it to grill, you can set it up like any other type of kettle grill. A charcoal chimney is likely the best way to start the briquettes or lump charcoal. Just lightly drizzle a little cooking oil on two sheets of newspaper. Stuff them under the charcoal chimney and light it. The oil will slow down the burn rate while also making sure there’s sufficient fire to start the charcoal burning. If you want to use it as a smoker, there are a few things you can do to give you better heat and smoke control. With larger kettle grills you improvise them as a smoker by building a small charcoal fire on one side of the fire bowl and then placing the meat on the grate on the opposite side. With the Old Smokey 18, you don’t really have the space to do this with anything bigger than say chicken leg quarters. With a little trial and error, you will likely find that the best way to smoke with it, is to build a small fire pyramid, then spread it out to the edges of the fire bowl. You can then place the meat to be smoked in the middle, with the damper vents in the bottom set open to just a crack. The dome of the lid will also help circulate smoke and heat. Depending on your personal preference the charcoal smoke alone might be all you need to impart the flavor and aroma you want. If your personal taste calls for hickory, applewood, or mesquite, then you should choose chunks of wood over wood chips. Soaking them overnight in water will help them smolder without flaring up and affecting heat control. The 18-inch chrome plated grill grates provide 220 square inches of space. This is enough to grill burgers for four or five people. With careful coal placement, you even smoke a small pork shoulder. 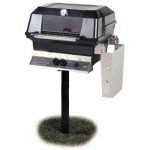 There are some no-frills grills with a friendly price tag that make you suffer the cleanup process as part of the savings. With the Old Smokey 18, you just need to scrape down the grill grates, then dump out the ash and spent coals into a metal bucket. The chrome plated grates can be a little bit on the sticky side. Lightly wiping them down with an oil-soaked paper towel right before you place the meat will help reduce this problem. The Old Smokey 18 comes with a two-year limited warranty against manufacturer defects. Keep in mind that they do require you to present your receipt in order to make a warranty claim. This is better than you will find with pretty much any competitor grill. 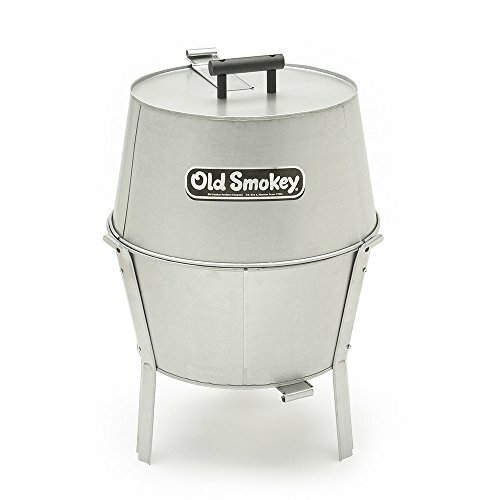 The Old Smokey 18 is a classic in the world of charcoal grills and smokers. There are some people out there who collect them like antiques and others who have yet to bask in its simplicity. It is just at home on your patio as it is tailgating in a parking lot. If you take care of it, it’s bound to take care of you for a long time. Just don’t expect any bells and whistles from this no-frills grill.